There are many individuals from the early days of bicycling that are often relegated to minor footnotes in history. Kittie Knox appears to be one individual who made a profound impact in women’s cycling, and was brushed aside under the carpet of history. What made Kittie Knox unique, you might ask? Not only was she a pioneer in women’s cycling, but she also helped break color barriers at a time when segregation was, more or less, the norm. Knox was born in 1874 to a mixed race couple; her father was a free black and her mother was white. While there seems to be very little information about Knox’s early years, by accounts she worked as a seamstress, who just happened to have a fascination with the bicycle. Even while bicycling was in its infancy, Knox joined the Riverside Cycling Club, one of the first the first African-American cycling groups, in 1893. At this time it was considered inappropriate for a woman to ride a man’s bicycle. Knox was daring in that she not only chose to ride a man’s bicycle instead of a woman’s, but also opted to wear men’s pantaloons or jodhpurs, making it easier for her to cycle. It was considered unladylike for women to wear pants, so her decision to do so was fairly controversial. And cycle she did. Cycling wasn’t just a fad for Knox: she found herself participating in numerous multiple 100-mile rides and in one instance came in 12th place out of 50 male and female cyclists in a major national race. In addition to her membership in the Riverside Cycle Club, Knox became a member of the League of American Wheelmen (now known as The League of American Bicyclists) in the spring of 1893. History reminds us how horrible segregation was, and, sadly, it was no stranger to cycling clubs. The powers that be at the League of American Wheelmen, under the guidance of one Colonel W.W. Watts, had instituted a color ban, which claimed that the League was to be open only to white members. However, there were no restrictions against women joining the organization, of which there were a few hundred at this time. Knox’s appearance at the League’s 1895 meeting in Asbury Park, NJ, caused a bit of a stir. 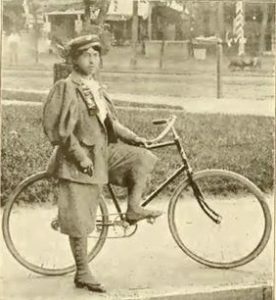 Held at the Asbury Park Hotel, which was segregated, many of her fellow cyclists enthusiastically embraced Knox, yet upon her entry to the convention she found herself snubbed while presenting her League credentials. Rebuffed, she quietly left, yet the seeds for discontent were already sown. Many of the organization’s members felt that Knox was treated unfairly, and the Massachusetts delegation of the League intervened to ensure that she would be able to participate in the meeting’s various activities. Regardless, while others came to her defense, her presence at the meeting was still controversial, especially when she danced with a white man during a social function, which caused a large number of attendees to leave in disgust. Despite Knox’s attempt to be independent as well as trying to break the color barrier, her life was tragically cut short, when she died in 1900 from kidney disease. She was buried in an unmarked grave. As for the League of American Wheelmen, after the kerfuffle with Ms. Knox, they officially amended their constitution to assert that their organization was for ‘whites only’. Amazingly enough, this little stipulation was completely forgotten for decades, until it was discovered and reversed in, believe it or not, 1999! But, this isn’t the end of the story. Kittie Knox would in fact make headlines once again. Author Lorenz Finison stumbled across Knox’s story, while researching a book on Boston’s bicycling history in 2006. Intrigued, Finison would spend the next several years searching for any of Knox’s living descendants. Once he found her relatives, they unanimously felt that Knox had not been given her due in history. Eventually, there was enough interest in Knox and her story to help her receive a properly marked headstone, and a final resting place at Mount Auburn Cemetery in Cambridge, Massachusetts in September of 2013…113 years after she passed away.